OTTAWA -- Canadian financial institutions have been ordered to treat what few transactions they conduct with North Korea with even greater diligence as the federal government tries to increase pressure on the nuclear-armed nation. 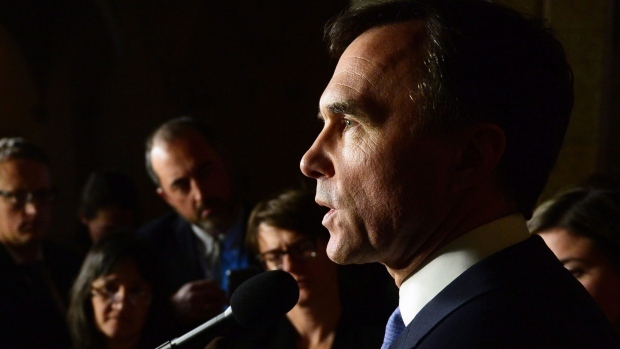 Finance Minister Bill Morneau quietly issued the directive last month following concerns that the North Korean government was skirting international sanctions through money laundering and other illicit financial activity. The number of financial transactions between Canada and North Korea is extremely small because of those sanctions, which the federal government imposed in August 2011. But financial institutions will now have to treat even those few that are allowed, which include remittances worth less than $1,000 and humanitarian aid, as potential cases of money laundering and report them to the government. The discussions will put a heavy emphasis on stopping North Korean money laundering as well as smuggling by sea, which U.S. officials have suggested could involve taking action against North Korean shipping. Finance Canada deputy spokeswoman Jocelyn Sweet said the directive came after the Financial Action Task Force raised concerns about -- and urged a harder line against -- North Korean money laundering in November. The task force is an international body of 35 countries, including Canada, the U.S., China and Russia, that is tasked with examining and developing measures to combat money-laundering and terrorist financing. Analysts have warned that the North Korean government uses money laundering and other illicit financial activity to develop its nuclear-weapons program, which was echoed by the Paris-based task force. "The directive complements Canada's robust sanctions regime already in place against (North Korea) and reinforces Canada's public statements identifying North Korea as a jurisdiction of concern," Sweet said in an email. Morneau's order is largely symbolic, said Garry Clement, a retired RCMP officer and current vice-president of the Association of Certified Financial Crime Specialists, and appears designed more to get other countries on board. Not only does Canada have limited financial ties to North Korea, Clement said, but Canadian banks and other institutions have been closely scrutinizing any transactions with the Asian nation for years. The problem therefore isn't with Canada, but countries like China that have been much less stringent -- and in some cases already implicated -- in money laundering with North Korea. "That's the only way you're ever going to tighten this up," Clement said. "So unless countries like China, like Iran and everybody came on the same page, it's really hard to shut down international flows." The U.S. recently sanctioned several companies and individuals in China, following years of complaints about money-laundering and illicit trade with North Korea. China, which was not invited to next week's Vancouver meeting, has started to crack down on illicit North Korean financing and smuggling, Brian Hook, director of policy for U.S. Secretary of State Rex Tillerson, told reporters on Thursday, but more is expected. "We have been very clear with them about the action that we need them to take against individuals or entities under Chinese control that are . . . helping or facilitating or supporting North Korea's nuclear and missile program," he said. "We've asked them to take action. They have taken action in some areas."